Lasithi Crete - in the east of the island. 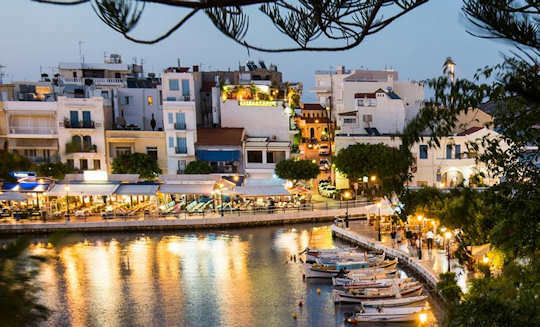 The charming town of Agios Nikolaos Άγιος Νικόλαος is 70 km east of Iraklion on the north coast, and is the capital of Lasithi nomos prefecture in Crete, Greece. It is said that this town is named after Saint Nicholas the patron saint of all sailors and of all of Greece, the modern town in built close to the site of the ancient city of Lato. It is also said that the town was named after a Byzantine chapel built nearby in the 7th century AD. With a colourful history and currently a population of nearly 20,000, set on the beautiful Mirabello Bay, the view across to the Sitia mountains is lovely and ever-changing. 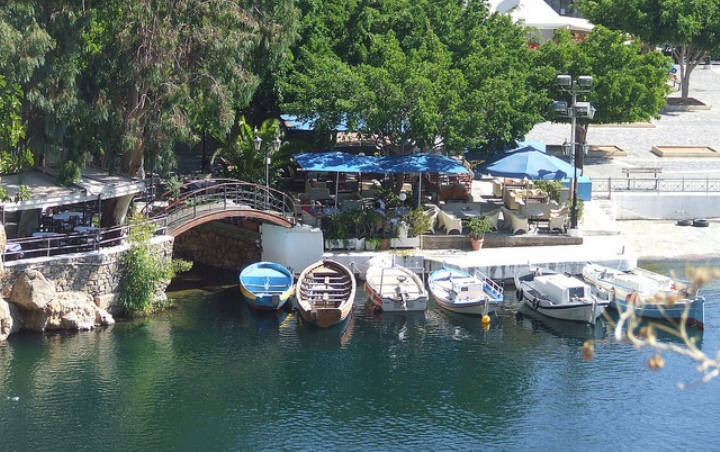 A unique and very pleasant town, with a character different again from the other towns of Crete, with its hilly streets winding back from the lake it begs to be explored. After its 'discovery' by the jet set in late 20th century, this town developed one of the best tourism infrastructures on the island of Crete. Luckily the development has not ruined the charm of this delightful town. 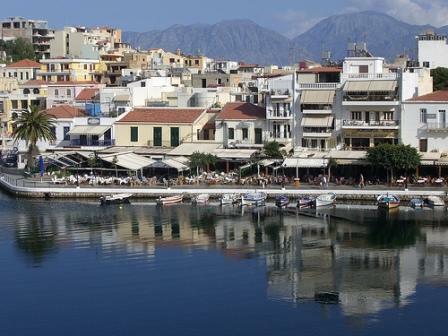 Lasithi Crete is a very exciting area of the island to explore, making a visit to the east very attractive. Lake Voulismeni Limni Voulismeni sits just behind the harbour in the centre of the town, with a channel joining the two. Originally a fresh water lake, the channel was built in 1870. 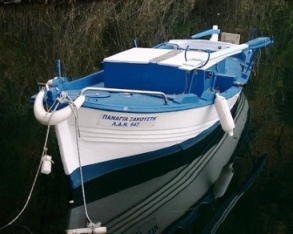 The lake is known as apatos bottomless. Is it? Come and have a look and you decide. If you look closely enough, you might see the goddesses come down and wash their hair in the fresh waters of the lake. There is a lovely promenade around most of the lake, the other side being steep walls of attractive red rock and creepers. 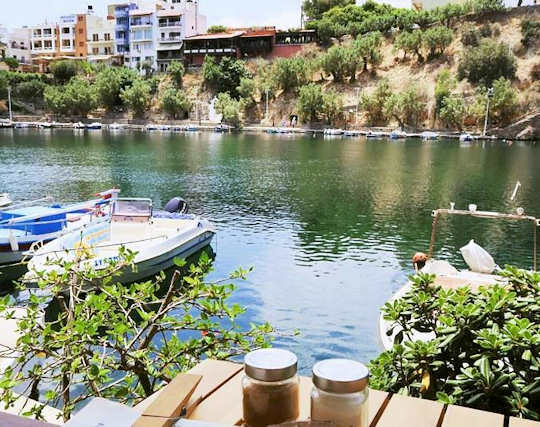 There is a small outdoor theatre right on the shores of the lake and many, many cafes and tavernas making the most of the breezes off the water. We enjoy strolling by the lake in the evenings, watching the stunning tiny kingfisher flashing azure as it darts around the lake and stops on the brightly coloured fishing boats. There are quite a few birds nesting in the steep rock wall of the lake, and a gorgeous little chapel, it stands out in white against the rocks. You can climb up the steps to get a good view of the lake, the channel and the town from the little park. 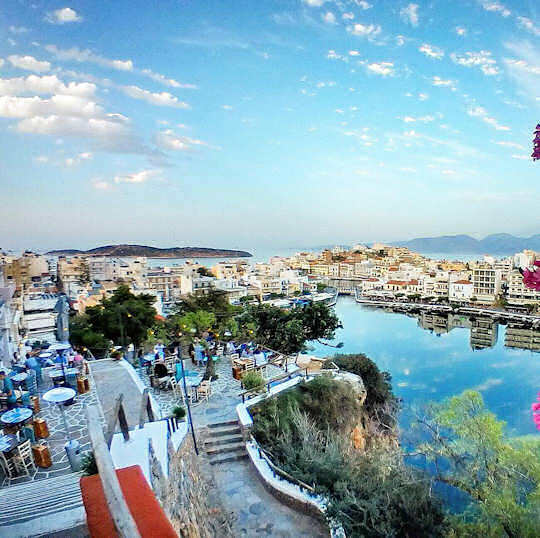 The lake and harbour, and the endless beaches stretching west and east, ensure a summery holiday feel in Agios Nikolaos at just about any time of the year. 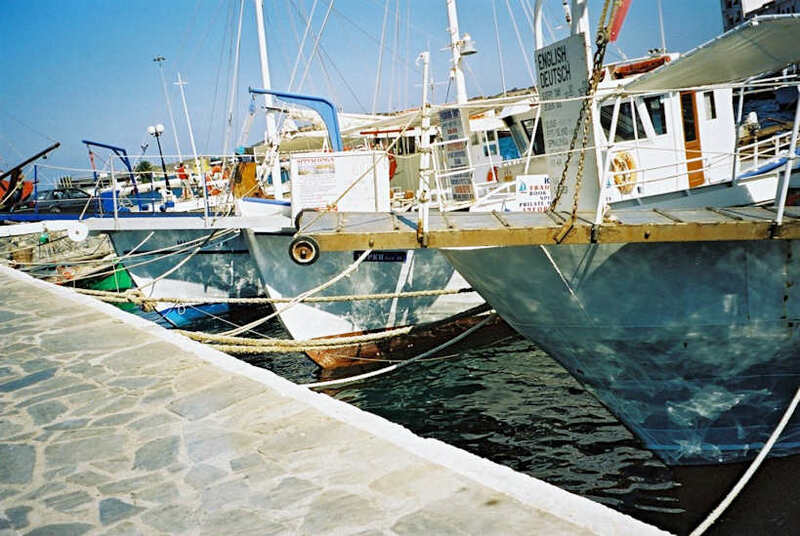 The wide harbour has plenty of room for pleasure craft and daily tour craft, and on the eastern shore is the large port, accepting large ferries and connecting Agios Nikolaos with the major Greek ports like Pireaus, Santorini and Rhodos, as well as the islands of Kasos and Karpathos. From here you can take tours to Spinalonga Island, Elounda, and Mirabello Bay. The beaches of Agios Nikolaos all have Blue Flag status and are clean and organised; EOT, Almyros, Ammoudara, Havania, Ammos, Kitroplateia, Ammoudi. They extend from the town out along the coastline and some of them are more remote. 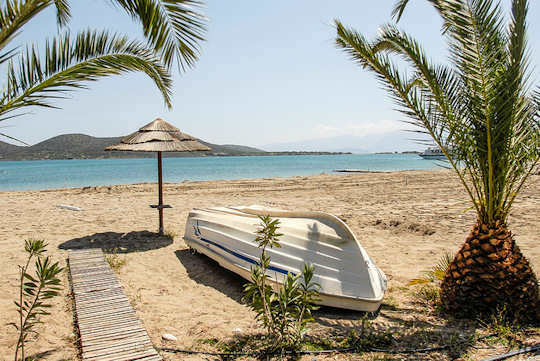 For more about Kitroplateia Beach, see our Beaches of Crete pages. We suggest four hotels in town for their central location and service. Prices and styles vary from the budget to the sophisticated, but each of them will allow you to walk straight out of your door and explore this wonderful town. 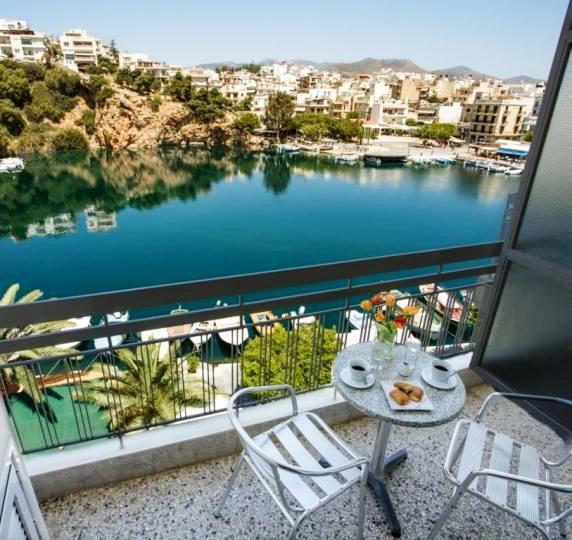 Hotel du Lac looks over Lake Voulismeni. Pergola Hotel overlooks the harbour and Mirabello Bay. The Palazzo Apartments and Sgouros Hotel overlook Mirabello Bay and are situated right on Kitroplateia Beach. Visit the Island of Spinalonga by boat from Agios Nikolaos - with departures also from Elounda. Enjoy a swim and a BBQ as well as an interpretative visit to this island full of stories. This is a 12 hour full-day experience. 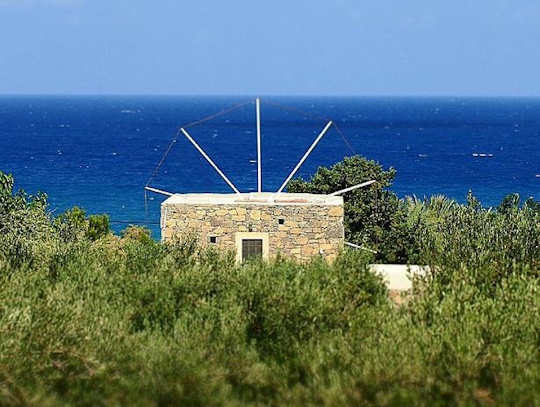 Ancient Kroustas Forest & Cretan Shepherd's Hut with Lunch - step into the real Crete. Enjoy a long traditional lunch, visit a stone shepherd's hut, see stunning scenery and Kroustas Forest. 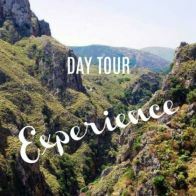 A 7 hour full-day tour. 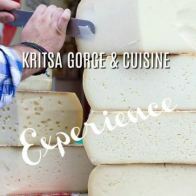 Kritsa Gorge to Plaka and Spinalonga with Meals - on this tour you will hike, swim, eat and cruise and see the best the area has to offer. Make your own dolmades and taste authentic local olive oil. An 8 hour full-day tour. 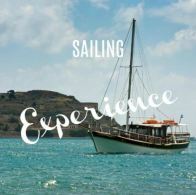 Sailing Tour from Agios Nikolaos - see Elounda Bay and Spinalonga on this tour of the beautiful Mirabello Bay, enjoy a cool dive at Kavos Krios. A 4 hour half-day tour. 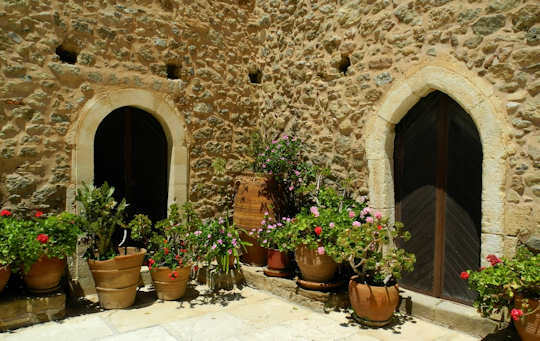 Lasithi Crete offers some of the most untouched and authentic villages, beaches, mountains and countryside to explore in Crete. 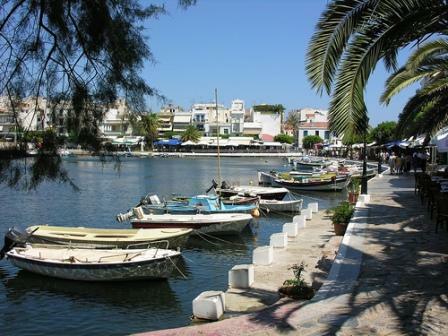 Sitia is a major town to the east, a thriving centre of olive and wine production. We loved our visit here and the authentic Greek character. 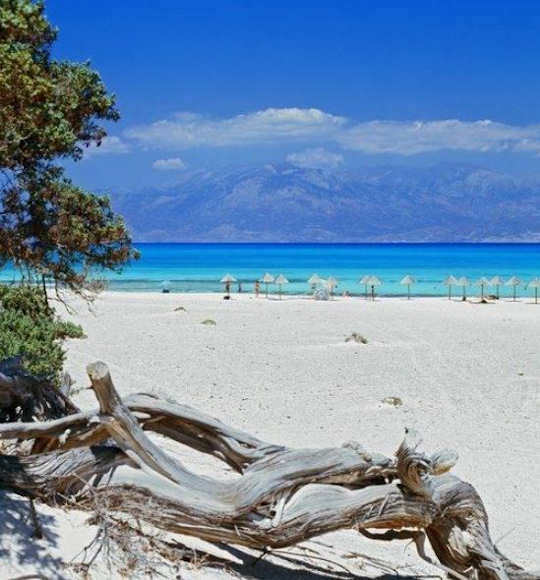 Ierapetra, the largest town on the south coast of Crete, faces the Libyan sea and surrounded by beaches and mountains. The Dikti Mountains and Lasithi Plateau are very close to Agios Nikolaos, yet the pace is slow and the air is crisp, a beautiful village to visit is Kritsa. Wonderful beaches and international quality luxury can be found in and around Elounda, just 11 km from town. 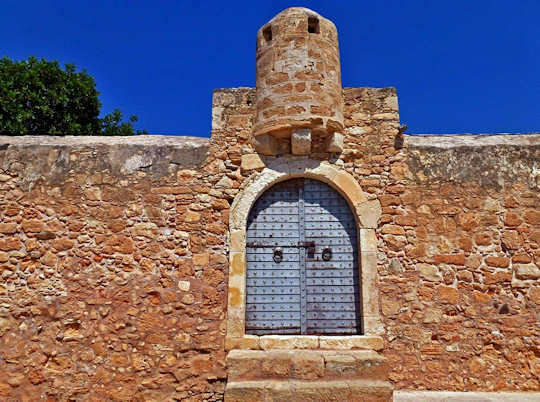 Toplou Monastery is 15 km east of Sitia town, it is a fascinating historic settlement and wine-making estate. Towards the eastern tip of Crete is Palekastro Village, and the beaches of Chionia and Kouremenos. 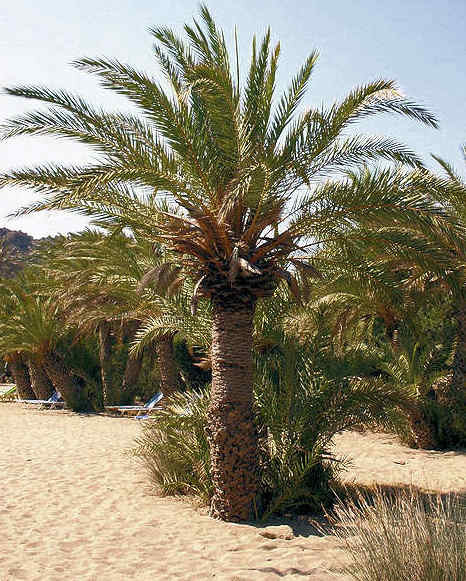 Two beautiful and unusual beaches to enjoy are Vai Palm Beach (above) and Kato Zakros beach, where the site of the ancient Minoan Zakros Palace waits to be explored.